In game week three, league contenders Class on Grass faced ALT Boys who are still to get off the mark this season. ALT Boys scored the game’s opener, before Class shook-off any pre-match nerves and went on a scoring spree, ending the first half in the driver’s seat six-one up. 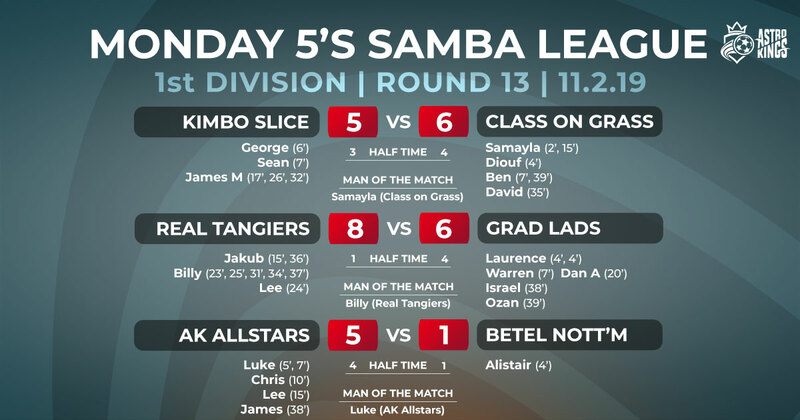 The second half was equally as enjoyable for Class, who extended their lead further, with Thierry and Jakub scoring three and six respectively. The Boys managed to grab two but it wasn’t to be their night, and now look to secure their first points from next week’s match-up with out-of-form AK All Stars. 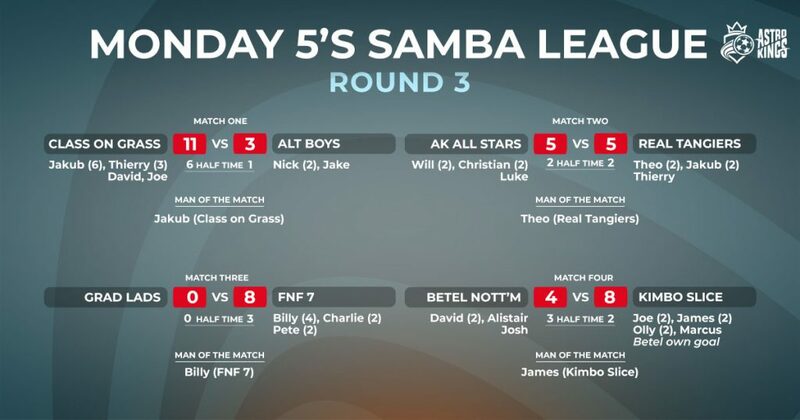 Last season’s title contenders AK All Stars were surprisingly still without points heading into this game, having started the season in horrible form. Real themselves were coming off the back of an important win against the powerful Kimbo Slice. Not many teams can boast being perfectly matched, but tonight’s game was the case. Both teams traded goals and a tight first half ended two-all. New players on both sides made the game extremely competitive and hard fought. AK have transferred in three ex-real players. Real themselves transferred in powerhouse Theo Brown who had a real impact in the game – if he wasn’t demolishing AK players, he was firing bullets at the AK goal. Equally the second half was a tight and well-balanced affair. It was perhaps AK who had the upper hand at one stage, having a two goal lead but let their lead slip as Real came fighting back to take the lead. A late equaliser from AK was well deserved and gave them their first points of the season. Both teams were undefeated heading into tonight’s fixture and both knew taking all three points could cement their position at the top of the league. FNF 7, having already notched up 29 goals this season, went into the break with a three-nil lead. The second half didn’t fare much better for the Lads. 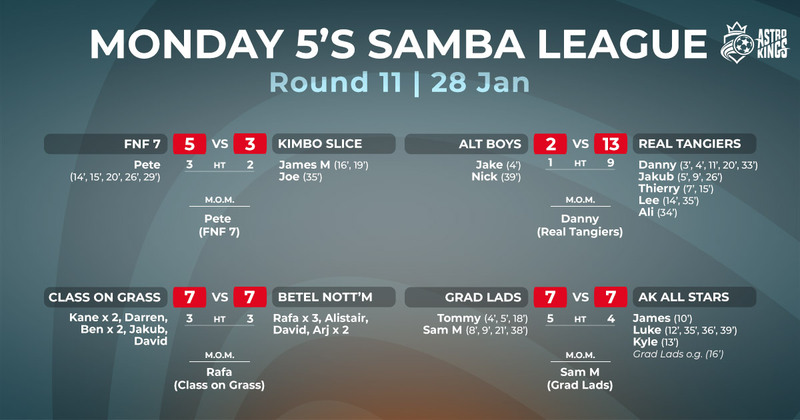 FNF continued to pummel the opposition goal and the game ended with them eight-nil victors in a complete white-wash. FNF celebrated braces for Pete and Charlie, and now with a total league tally of 14; Billy added four to his account and his golden boot defence. 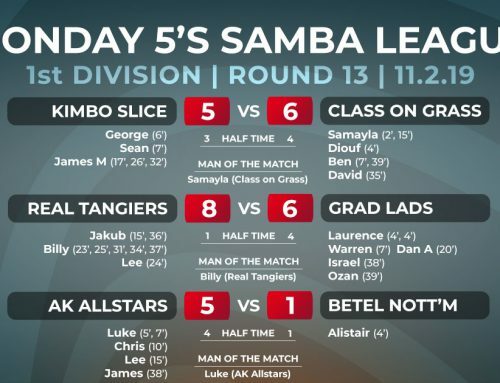 Betel and Kimbo were looking to get back to winning ways following defeats to FNF 7 and Real Tangiers last time out and were keen to grab all three points. 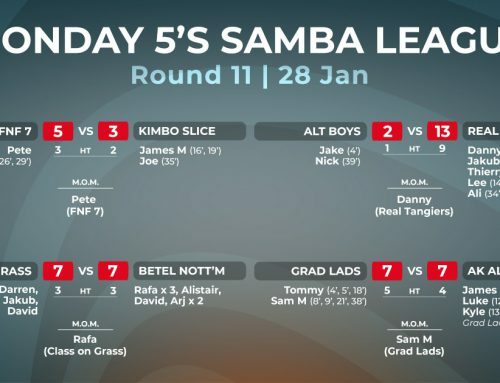 Reigning champions Betel got off to a good start to lead two-nil before Kimbo fought back to trail by a single goal at half-time. The second half saw a massive swing in Kimbo’s favour, conceding just the one goal they went on a scoring spree, ending the game as eight-three winners. Joe, Olly and James grabbing two a-piece, and with thanks to an Betel own goal – a huge deflection of David – they secure all three points. Now with only three points separating the top four teams, there’s everything to play for in this league, and there could be a new league leader this time next week.